Say It With Sign is the most comprehensive video series on signing ever produced. Sign Language is the 3rd most used Language in the U.S. behind English and Spanish. 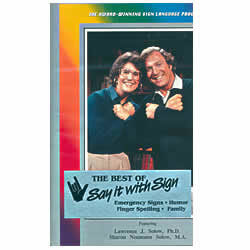 This 20-hour Home Video Library teaches conversational sign language in a fun, easy and enchanting manner. You'll learn why this romantic language has such sensitive beauty. Volume 4 (Running Time: 120 min) Time-Part I - The signs for day, week, month and tomorrow are demonstrated and discussed. And, getting into a sports mood, the Solows teach the signs for football; fingerspelling includes the letters H, O, M and E. Sharon dramatically sign-sings Tomorrow, from the popular hit musical 'Annie.' Time-Part II - Signs relating to the seasons are demonstrated and discussed. How pets obey sigh language: the Solows demonstrate how signs can come in handy for communicating across a crowded room or through a window. Sharon sign-sings My Favorite Things. Fingerspelling lesson: N, O, P and E. Time-Part III - More signs for times and seasons are demonstrated and discussed. The Solows explain the difficulty of speaking simultaneously and Sharon sign-sings Lovely. Fingerspelling lesson: Q, U, I, T and E. Numbers - Big families become the topic of conversation as the Solows compare relatives. Numbers from 1 through 15 are demonstrated. Fingerspelling lesson: R, O, S, T and E. Sharon and Larry join for a rousing sign-singing rendition of Anything You Can Do I Can Do Better.